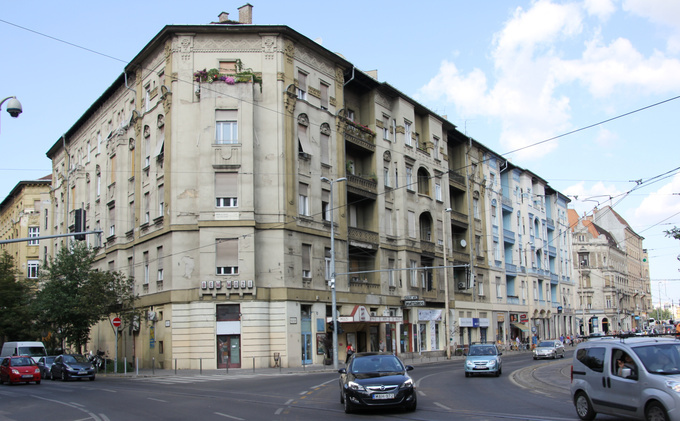 This part of Budapest hasn’t experienced more excitement since an infamous payoff of the underworld at the end of the ‘90s than recently, on a hot Monday afternoon. The live transmission of a "car chase" ushered the driver of the Continental GT to escape under a Hello Kitty umbrella. At the opposite corner, where a Bentley was parking between two no parking signs yesterday, there's an armoured security van. The siren of the ATM machine has gone off and nothing, not even the rumbling sound of the tracks bending under the 30-40 year-old Ganz tram can suppress the shrieking sound. We're on the corner of Margit utca and Margit körút. 5 meters away from us the crew of one of the country's two biggest TV-stations are filming the incident. Their biggest rivals have just left. They are recording material for the evening news. 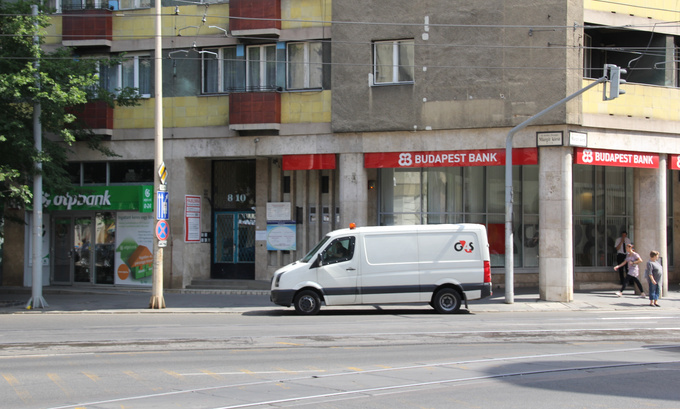 Nobody, including the police, cares about the ATM and the van. 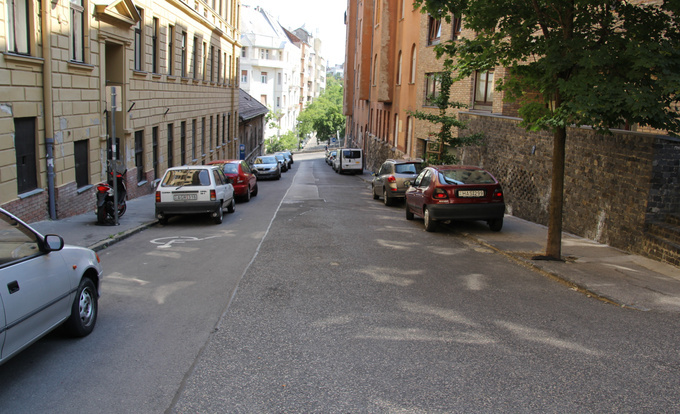 It's the coolest 20 square meters of the capital city that everybody is interested in right now, the spot where the car chase – as named by the folk of the internet- of the decade took place the previous evening. On the other side of the road there is a 105 year-old cinema and above it, the offices of 444.hu. Standing in the cool entrance hall of the old tenement building we are trying to figure out where the offices are located exactly, but find a long closed stationer's instead. The tiny kiosk stuck under the stairs has become one with the building, its faded colours matching the dull grey of the stairs. The contrast between the depressingly dark hall and the lively passageway going round the courtyard is sharp, but there's nothing here to indicate that the offices of the pioneers of the new alternative journalism are lurking somewhere between the bicycles and potted plants. We get the address and head for the elevator. We can almost feel the pain of the ancient machine in our bones as it carries us up a level stretching its weathered cables, then at the end of the passageway we enter the offices. The editor in chief of the premium punk news site, Péter Uj is greeting us wearing a half-buttoned, vivid shirt and sidewhiskers. His site will enjoy the hype for a few more days, then it's over to another news story. The poignant emptiness and the minimalistic nature of the offices made up of adjoining flats conjures up the atmosphere of the offices of the turn of the century, but the crew consisting solely of men lusts far more after female co-workers than modern comfort. 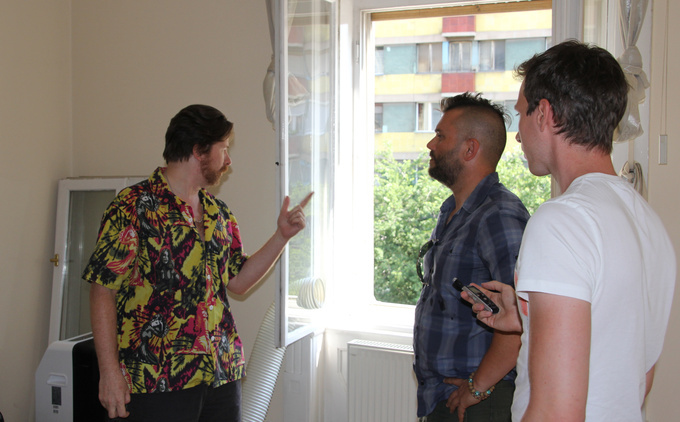 We are shown around and meet Tamás Botos, the photographer of 444.hu, who started the chase. The window used for surveillance the day before is open, the tape with which the webcam was fastened to the window-sill is still there. Out comes the camera that recorded the goings on, drawing more viewers than the material about Márton Bede being on a psychedelic trip at the Balaton Sound festival recorded a few days prior. Botos spotted the matte black Continental parked on the pavement between two no parking signs at 1:30 p.m., then settled down by the window equipped with a camera waiting, with the patience of Lee Harvey Oswald, for the driver to show up. The Bentley wasn't just sprawling at some desolate place left empty due to careless city planning, it was actually hindering the pedestrian traffic on a very busy pavement. Knowing that it couldn't have been some average meathead parking his car like that, Botos had been expecting a big fish. Some of 444.hu had seen the car parked at almost the same spot a week before, but missed the driver's arrival back then. They weren't going to let that happen again. The area is full of parking spaces, mind you. Some of Buda's cheapest parking lots are nearby, with a charge of 0.5-1 euro per hour, but if walking isn't below your dignity, about 400 m and a stairway of about 70 steps away there's a free parking lot next to the shrine of Gül baba, the grave dating from the time of the Turkish occupation. None of them are ever full, although Peter Uj remarks that the financial convenience of the latter is compromised by having to stumble on the decrepit stairs. We had a good look at the grave of Gül baba. Homeless people are bumming and teenage smokers are puffing away secretly among the roses of the Muslim monk known as the father of roses, and the state of the stairs really is exasperating. Choosing to violate the parking rules over experiencing the visual and physical terror is somewhat understandable. The office of the driver of the Bentley is about 20 m away from the pavement where he left the ostentatious whale of a car. Bad luck that the windows of the editorial offices are facing that way. At first the crew was only posting short news and updates in connection with the Bentley, then a webcam was fastened to the window-sill and the live ustream started. The owner was soon identified as a seasoned anarchist. The owners of the cars of this calibre are more or less known by name by the locals, and the Continental with the Slovakian number plate had been spotted all across the capital city, mostly under no parking signs, with a disabled parking permit displayed on the windscreen in the weeks before. Why hasn't the car been swept away by the wrath of the public, you wonder? The last time Hungarians were in a punishing mood they let it all out on the Soviets. That was over 50 years ago. The previous political regime gave way to capitalism accompanied by the quiet, crackling sound of cutting the iron curtain – no action, just the pervasive indifference of the petit bourgeois. Within a few hours, thousands were watching the live stream of the Bentley cutting a lonely figure on the concrete. The social media were grinding out tweets, posts and whatnot about the incident. Some came to watch, others arrived with cameras to leave with selfies taken of themselves posing in front of the car. 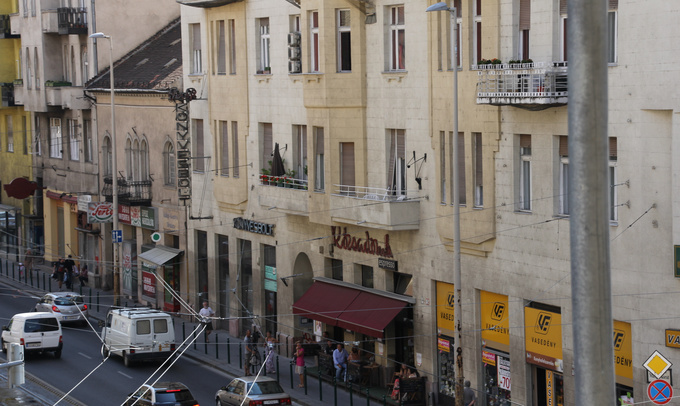 A Monday afternoon hasn't been this exciting in Budapest for a long time, and this particular corner hasn't received this much attention since February 1998 when the head of a media empire, János Fenyő was shot in car while waiting at a red light. At this point it was obvious that the chase of the Bentley driver could proceed in two ways. The driver would've been better off by driving off before the traffic controllers would remove the car, but that would've been the end of the show – the meathead would have gotten away with it without even being fined, the public would've been disappointed. At around 4 pm the traffic controller folk arrived, making sure the absolutism would have consequences. At first they said they would get a trailer and transport the Bentley, but half an hour later the police showed up, saying the car wasn't in the way of traffic, thus it would only get clamped. The cost of getting that removed is 85 euros (25,000 forints), which equals about 100-150 hours worth of pay parking, and there's a chance that the hard iron lock damages the alloy wheel. A Bentley with a wheel clamp is not newsworthy in itself. The media hype started by 444.hu didn't make the incident seem more than another case of a notorious offender violating parking rules. Things took an exciting turn when the news site managed to reach the suspected owner. 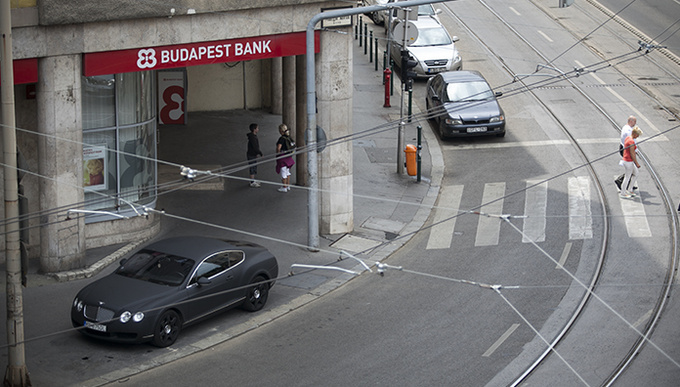 It wasn't hard: there are two matte luxury sports cars in the whole of Budapest. One of them is this Bentley, the other one is a Rolls-Royce Phantom with a Beast-1 number plate, but that has been rusting on the premises of the tax office squeezed in between a Maserati and a Porsche for some time now, seized. 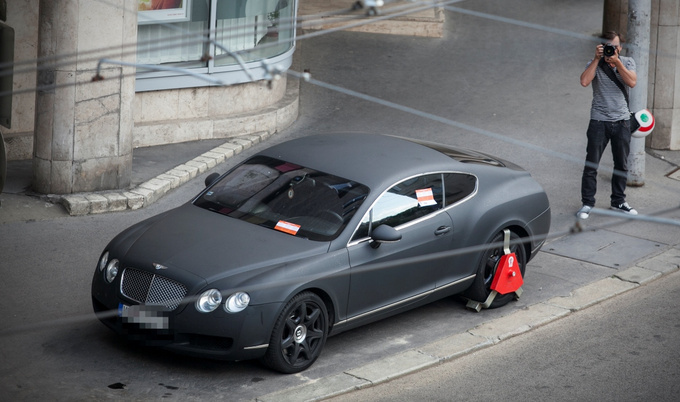 The driver of the Bentley claimed to be a friend of the alleged Belgian owner of the car. As he pointed out, he can't be the owner, as proven by lots of papers. Regarding the Slovakian number plate, a common trick used in Hungary to avoid paying the registry fee, he did come up with some muddled story about the European interests of the friend, and explained the necessity of parking on the pavement between two no parking signs with having to be able to keep an eye on the car. He, of course, knows nothing, he was only asked to keep an eye on it while said Belgian owner is abroad. OK, the pieces of the story do not really fit together, but it was still masterminded better than an older explanation of his, when he justified violating the parking rules, topped by the use of a disabled parking permit, by claiming to use the nearly 600 PS luxury sports car for the transportation of his ill and elderly mother. See, the real problem is not that he is bad at violating parking rules. 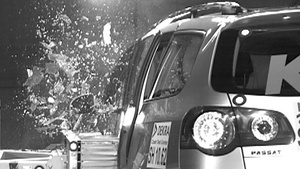 Not much was happening in the following hours, but the online interest did not decrease, and there were comments appearing on several sites encouraging the damaging of the car. The 444.hu crew were waiting patiently, as were the majority of the Hungarian press by then. Lots of people were awaiting the finale eagerly, the atmosphere on the scene was starting to resemble that of some music festival. A nice momentum of the evening was when the bonnet of the Bentley was covered by a cloth with the YOLO (You Only Live Once) tag written on it. By then the viewers had become even more courageous and the GT was almost certain to face the next day adorned by some unique design. This was an opportunity for setting a precedent by teaching the troublemaker a lesson, which would surely have turned every other meathead in the city into a decent citizen keeping the rules of traffic by the next day, but then 5 or 6 policemen showed up and the friend of the Belgian owner arrived by taxi, wearing a hoodie. You could feel the end was near, so many of the spectators desperately rushed to strike one last pose on the corner. After a quarter of an hour of bargaining, the wheel clamps came off. But the best was yet to come. Adding another memorable case of parking violation and a string of obvious lies to his resume, the guy clad in the hoodie made sure to lose all remaining scraps of his dignity by shielding his face from the curious crowd with a Hello Kitty umbrella. This is how he walked to the car, this is how he got in and drove off. The spot was empty the next morning, but the man, an advertising expert by profession, kicked off the day by letting off steam at the 444.hu offices. We haven't heard anything about the Bentley since, but as an aftereffect of the incident many readers have spotted a white BMW X6 parking at the same spot on a Google Street View picture taken on May 2012. It's said to be his, too. Some say if a car has been crashed earlier in its life, it will prove impossible to fix. But the truth is more complicated than that.